Give your business a website that it deserves and impress your visitors with faster, uninterrupted enterprise speeds and protection so that even Google will favour your website. This is a step up from our Basic Web Hosting plans for those looking at only the best for their businesses. With Business Hosting Plans, experience the next level of Web Hosting. Your websites will run on high-performance flash drives (SSDs), so it is ultra-fast and responsive. Enjoy blazing-fast performance without a big price tag. 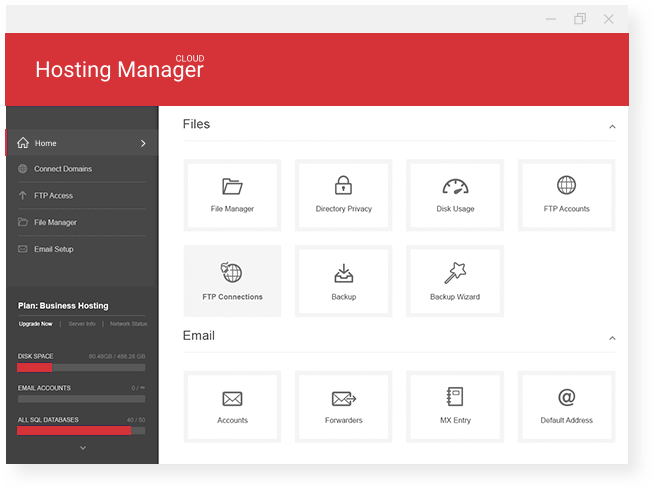 All-in-one hosting platform to manage your websites, emails and domains. Easy to use and full of useful hosting features. Business hosting boasts of high availability, top performance and greater resources, combining it with a low-complexity management panel for maximum productivity for businesses. Get assured of fast loading site speeds with webSpeed Assurance. We monitor the speeds of business hosting websites that are slow and provide a free one-time CMS configuration optimisation. Want to build a website by yourself? We provide Free Premium Wordpress themes and plugins to help you kick-start your online presence. Build up to 10 websites with our bizPlus plans! An SSL certificate provides a green lock of assurance for visitors and encrypts sensitive information through your site. A dedicated IP ensures greater deliverability for your emails. All our hosting plans are covered by our in-house 24/7 SuperSupport Team. Be it via email, phone, livechat or even remote help, we will be there for you! Enjoy more allocated server resources with our business hosting plan, more available bandwidth and improved capabilities with the faster server. Need not worry about updates and support for our software - our SuperSupport team manages that for you. Install your favorite applications and scripts easily with our simple one-click auto installer. Out dedicated migration team will handle the website migration, ensuring a seamless transition process from your existing host. Worry not when you transfer to Vodien! Create your very own personalised email alias with your purchased domain name, with advanced anti-spam protection systems and higher emails per hour limits. Data loss will be the least of your worries with our daily remote backup for your files and folders, all-in-one access with restoration functions from your control. Enterprise anti-spam solution for all your mail boxes, filters your spam and malicious emails with up to 99.98% spam filter accuracy. All our hosting plans are covered by our 24/7 SuperSupport, premium support via phone, live chat and email. 6-hour resolution time guaranteed for common issues! Expecting high volumes of traffic? We give you higher bandwidth and data transfer rates so that you can run your website smoothly! Full control and functionality over your websites, domains, emails, files and folders with the industry leading web control panel, cPanel. Easy-to-use installer allowing you to install over 400+ applications, scripts, programmes and many more. You can also install popular CMS such as WordPress, Joomla or Drupal! SiteSentry™ is a technology developed by Vodien that tells you if an attacker has modified your website without your knowledge. Our anti-malware threat management system protects your business and employees against phising emails, and emails with common viruses, trojans, or malwares. Business hosting users are entitled to greater server resources. Enjoy more available bandwidth and improved capabilities with the faster server. Get a copy of all the emails that gets received or sent via all the created email inboxes. This can be enabled all the time, in the background. Great support compared to my previous web hosting company. Quick understanding about the issue & easily call through 24 x 7 call facility. Feel highly secured. Thanks to Vodien team support! It's a nice experience upgrade process. Thanks, for the speedy reply. Always prompt. A web hosting service allows you to store your web files through high-powered network of computers called web servers. In simpler terms, we are providing you with the resources to power your website on the world wide web. To learn more about Web Hosting, be sure to check out our "What is Web Hosting and Why Do You Need It?". Our business hosting plans are under a shared hosting environment, a premium web hosting service for growing businesses with multiple features to power up your websites. Shared hosting is suitable for personal blogs, small business websites, portfolios and even for ecommerce business. For shared hosting environment, Server resources such as processor, memory, storage, bandwidth and third party software will be shared among other users on the same server space. WEB HOSTING and BUSINESS HOSTING packages are considered under Shared Hosting plans. Click here to learn more about the difference between Shared hosting, VPS Hosting and Dedicated Servers. How is Business Hosting different from Web Hosting? Customers whom purchased Business Hosting packages with annual or biennial terms are entitled to a Free SSL certificate for one domain name. Vodien will assist to install the Free SSL on the main hosting domain name. For more information, you can refer to our SSL Certificates page. We offer three main types of Web Hosting, namely Shared Hosting, VPS Hosting and Dedicated Server Hosting. Depending on the amount of resources or level of customisation you require for your website, we will be able to provide recommendations for the suitable plan. For basic websites, we recommend you to start off with our webValue plans. Our plans are easily scalable so you can look at upgrading your hosting account as soon as you require more resources. How many websites can I host with my Business Hosting Account? Ideally, each business hosting account should only have one main domain, for security and performance optimisation. To value-add and provide convenience for our customers, we provide functions such as add-on domains, sub domains and parked domains. Why are there limits placed on certain type of resources? Vodien aims to be transparent in our hosting packages; the hosting plans have a pre-set amount of resources to enable all business hosting customers enjoy similar performance and stability, in view of our Fair Use Policy. If you have certain requirements needed for your hosting account, do get in touch with us and we will try our best to customise a suitable plan for you. I have a website with another web host? Can I transfer over to Vodien? Yes, Vodien provides free website migration to ensure that your site is properly moved to our servers with minimal downtime and without losing your important data. We also offer free email migration services for the first 5 email accounts. Subsequent email accounts are subjected to an admin fee per account. Click here to view our transfer promotions to Vodien. What else do I need other than a Web Hosting plan? Apart from a hosting plan, you need a domain name to act as the address for your website. Domain names start from S$20/year, be sure to check out our domain name availability platform to secure the perfect domain name for your website. You will need a web developer to create a website as well. Otherwise, if you would like to try to create a website on your own, you can use our free WordPress guides, resources to kick-start your online presence.